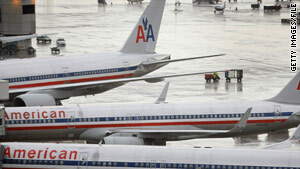 American Airlines flight 1612 was headed to Chicago from San Francisco when the first officer became ill.
(CNN) -- A flight attendant with a pilot's license ditched her normal duties and stepped in for a sick copilot of an American Airlines flight before the plane landed in Chicago, Illinois, airline officials said. The first officer had become sick with "flulike" symptoms Monday, according to Tim Wagner, a spokesman for American Airlines. "He went back into the passenger cabin," he said. "That's when the captain began to solicit help from any passengers with a pilot's license." One of the five flight attendants on board flight 1612 from San Francisco, California, told the captain that she is a commercial pilot, and she immediately took over the first officer's responsibilities, Wagner said. The Chicago Tribune has identified the flight attendant as Patti DeLuna, 61. "I was the best available [backup pilot] they had on the plane," DeLuna told the Chicago Tribune. "I spent a lot of time in the cockpit looking at the flight deck and asking questions. My first question to the captain was, 'Where are the brakes?'" The plane, carrying 225 passengers and seven crew members, landed safely at O'Hare International Airport at 4:24 p.m. Monday. The first officer, who is based in Chicago, was immediately taken to the hospital by paramedics waiting on the ground. He was treated and released and was resting Tuesday, Wagner said. "The entire incident was handled very well on all accounts," Wagner said. He was not able to elaborate on the flight attendant's background Tuesday afternoon or provide any details of her piloting experience. The flight attendant is based in San Francisco, the captain in St. Louis, Missouri.